Welsh composer Karl Jenkins, born in 1944, is a prolific composer who has composer many pieces of instantly recognisable music. He also sports a very fine moustache indeed! Karl regularly features in the Classic FM Hall of Fame. In the 2009 listings, he holds the number one spot in the top 10 British composers list and joint 9th in the top 10 British composers list, the only living composer to appear in the top 10. Karl Jenkins is the UK’s most popular contemporary composer, and one of Wales’ most versatile and critically-acclaimed musicians. 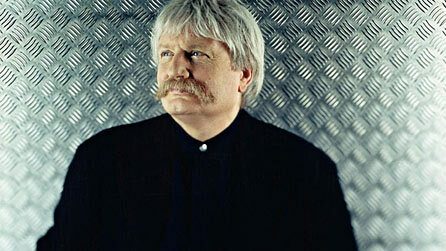 Karl Jenkins was born in 1944 and was raised in Penclawdd, South West Wales. His father was a school teacher, organist and choir master, who taught Karl music theory and the piano. Jenkins initially focused on playing jazz, with performances at Ronnie Scott’s legendary club. He co-formed the group Nucleus, which won first prize at the 1970 Montreux Jazz Festival. Jenkins wrote the majority of Nucleus’ first two albums, Elastic Rock and We’ll Talk About It Later, both of which were dizzying explorations of jazz-rock fusion. Critical acclaim followed, though financial gains were harder to come by. Jenkins and drummer John Marshall left the band in 1972 to join Mike Ratledge and Hugh Hopper in Canterbury prog band Soft Machine. In their time, the band would play venues as diverse as Carnegie Hall, the Proms and the Newport Jazz Festival in Rhode Island. Jenkins went on to lead the band during various line-ups, until they disbanded in 1984. Adiemus was an ambitious classical crossover, which topped music charts around the world and has been conducted by the composer in Japan, Germany, Spain, Finland Holland and Belgium, as well as at London’s Royal Albert Hall and Battersea Power Station. It also led to a series of further Adiemus albums. Currently on the ATCL Diploma syllabus is Boogie Woogie Llanoogie. This entry was posted in Karl Jenkins, Piano lessons and tagged Adiemus: Songs Of Sanctuary, Classic FM Hall of Fame, Jenkins, Karl Jenkins, Mike Ratledge, Newport Jazz Festival, Royal Albert Hall, Royal Welsh College of Music & Drama. Bookmark the permalink.